By the time Diego de Almagro the Elder undertook his expedition La flor de las Indias (The Flower of the Indies) in 1536, and Pedro de Valdivia and his conquering host journeyed through the valleys of central Chile in 1540, the Spanish expansion into the new continent and the annexation of the indigenous peoples to the Spanish Empire were relatively complete in vast areas of Mesoamerica (1519) and the Central Andes (1532). Diego de Almagro, as the appointed Adelantado (Provisional Governor and Justice) and Governor of Nueva Toledo, obtained permission to conquer the territories of what is now Chile. He left Cusco, traveled along the southern Andes and passed through Alto Perú (now Bolivia) before reaching northwest Argentina and crossing the Andes Mountains into the Copiapó Valley. From there, he continued southward through the transverse valleys up to the mouth of the Aconcagua River. One of his captains entered the great central valley, exploring the Maipo and Mapocho river basins. The group’s encounters with local indigenous people were marked alternately by hospitality and violence; at time the natives would flee from their homes, taking supplies with them or burning them to stop the expedition members from provisioning themselves. The conquistadors’ imaginations were set alight by the valleys and ravines endowed with abundant freshwater springs and rivers and dotted with settlements in which the indigenous people grew crops and raised livestock, and the gold mines of Marga Marga served as an additional attraction. Almagro sent men further south by both land and sea to gather information about the territory, its resources and people. When he received news of an indigenous uprising in Peru against the Pizarro brothers, Almagro decided to abandon his enterprise of conquest and return to Peru through the arid northern desert. For his part, Pedro de Valdivia—carrying an image of the Virgen de Nuestra Señora del Socorro (Our Lady of Help)—left Cusco with permission to conquer and populate the provinces of ‘Chili,’ which was both the name of one of the area’s central valleys and a reference to the cool climate of that land. The expedition journeyed to the Valley of Arequipa, in southern Peru, then crossed through Tarapacá and the Atacama, marching through the Uninhabited Lands to the Valley of Copiapó. From there, the force followed in the footsteps of Almagro, traveling through the Aconcagua, Mapocho and Maipo valleys, where the men observed the same lush, fertile landscape as Almagro had. They were particularly impressed by the irrigation canals that watered the land in localities such as Huechuraba, Apoquindo, Tobalaba, Ñuñoa, Quilicura, Tango, Apochame, Malloco, Talagante and Melipilla. The people who lived there grew chilies, beans, potatoes and corn, hunted guanacos and raised llamas. They gathered wild fruit and other foods and natural materials from the surrounding meadows and grasslands. They used the many local tree species (boldo, peumo, quillay, algarrobo and espinillo, among others) for a variety of purposes. Central Chile had received indigenous people from near and far, from the semi-arid North, Northwest and Central-west Argentina, and even southern Chile, and the different indigenous groups that lived here had well-established social, political and economic networks. The area also was home to indigenous hunter-gatherer groups that lived in the mountains and used the valleys only seasonally. Thus, the valleys of central Chile were far from culturally homogenous or static. Additionally, the expansion of the Inca Empire, Tawantinsuyu, into these lands left its mark in Aconcagua, Mapocho, Tango, Malloco, Talagante and Maipo in features such as tambos (waystations) and administrative centers, roads, and irrigation works. The Inca had also redistributed the land when Inca officials from Cusco arrived along with colonies of mitimaes (tribute laborers) such as the Diaguita from already-conquered lands further north. They established relations with such local authorities as Michimalonko and Tanjalonko, the chiefs of the Aconcagua and Quillota valleys, respectively. In late 1540, Valdivia decided that the Mapocho Valley was the most advantageous spot for establishing the first city in this new land. He called together the local chiefs and told them they must hand over the lands around Cerro Huelén (now called Santa Lucía). In February 1541, master builder Pedro de Gamboa traced out a plan for the city, dividing it into blocks and laying out the first streets. A forest of acacia trees marked the northern limit of the city. Valdivia then created the board of governors, called the Cabildo, appointing various executive officials (alcaldes and regidores) from among his main collaborators. That year, on September 11, indigenous people from the Aconcagua Valley, Santiago and the valleys to the south, led by Michimalonko, attacked the city in order to free several Mapocho Valley chiefs who had been imprisoned there. The residents prayed to the patron saint of the city San Santiago ‘mata moros o mata indios’ (Saint Santiago, slayer of Moors and of Indians), to save them. 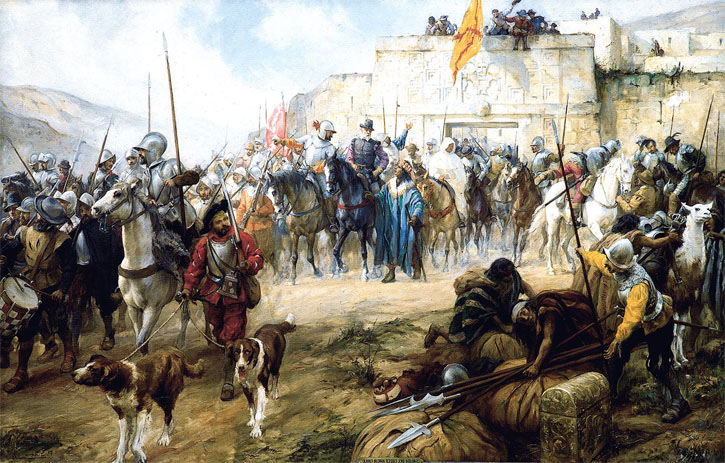 After several hours, and after executing the imprisoned chiefs, the Spaniards were able to put down the attack. The city remained cut off until 1543, however, when a contingent of reinforcements arrived on the ship Santiaguillo, disembarking in the Bay of Valparaíso. A few years later, the Spanish conquest of Central Chile was all but complete, though it had come at a cost: armed conflicts, negotiations, native attacks on and razing of the city, and the forced march of native picones from Aconcagua, along with Mapochoes and Maipochoes, to lands further south. The awarding of the first land grants (mercedes), the establishment of encomiendas and the relocation of the local population to these feudal estates, were all essential features of the Spanish occupation. Hand in hand with the assignment of indigenous labor to agricultural and livestock production, public works, and mining was the reconfiguration of indigenous lands and society. Land was allocated to native communities, widows and chiefs on the condition that they pay tribute to the Spanish authorities; these allocations were recorded by the official “Visitor” Ginés de Lillo in 1603. Administrative and ecclesiastical boundaries were established over the indigenous lands of Central Chile to homogenize the territory and its peoples, changing the local indigenous landscape forever. The mission districts of the Catholic Diocese of Santiago included Aconcagua, Colina, El Salto, Melipilla, Llopeo, Ñuñoa, Tango, and Aculeo, each of which incorporated villages and lands inhabited by indigenous groups. By around 1650, ranching, agricultural estates, wheat crops, vineyards, and cattle- and sheep-raising were the main productive activities carried out by the Spanish conquerors. The native population was markedly declining and, coupled with the process of mestizaje, led to the emergence of other social actors and new labor systems such as inquilinaje (tenant farming). Many questions remain about the arrival of the Spaniards in central Chile and the consequences of their contact with native populations. Are Mapudungun, Quechua and other indigenous languages that were spoken at the time similar to those we hear today? What stories and memories lie hidden in place names such as Apoquindo, Ñuñoa, Mapocho, Pudahuel and Maipú? What about the social celebrations and community festivities that were held, in which drinking, singing and dancing provided opportunities for reaffirming social bonds, identities and the collective memory? Were they similar to today’s cahuines?